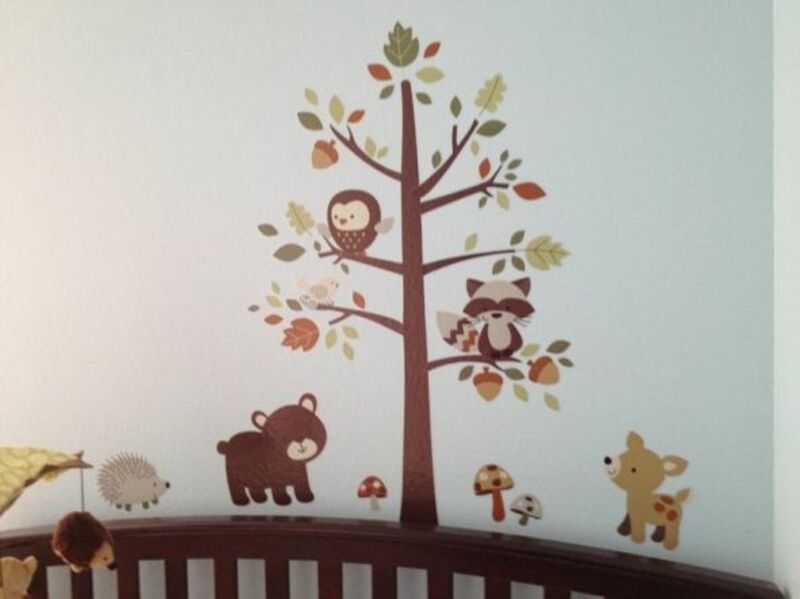 Woodland and Forest are the most relaxing themes for a baby room. 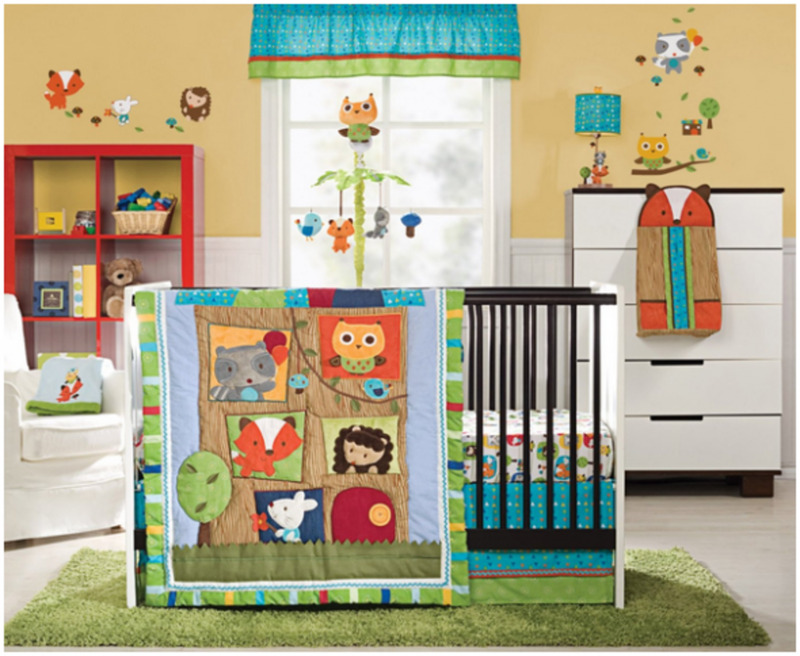 A little one will be at one with nature in his sweet tree and animal nursery full of adorable forest animals and happy little trees. 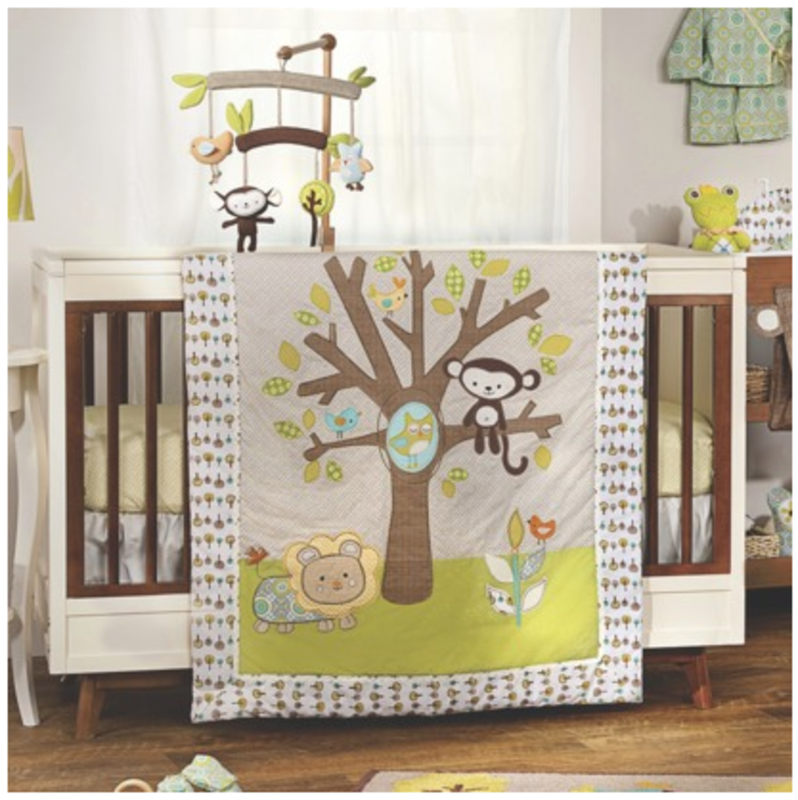 Check out all the bedding collections that feature a woodland forest nature theme for your stylish and earthy little one. I've found everything from pink and sea green bedding to a Caribbean color palette. Plus, see my easy DIY project ideas to design and accessorize your room. 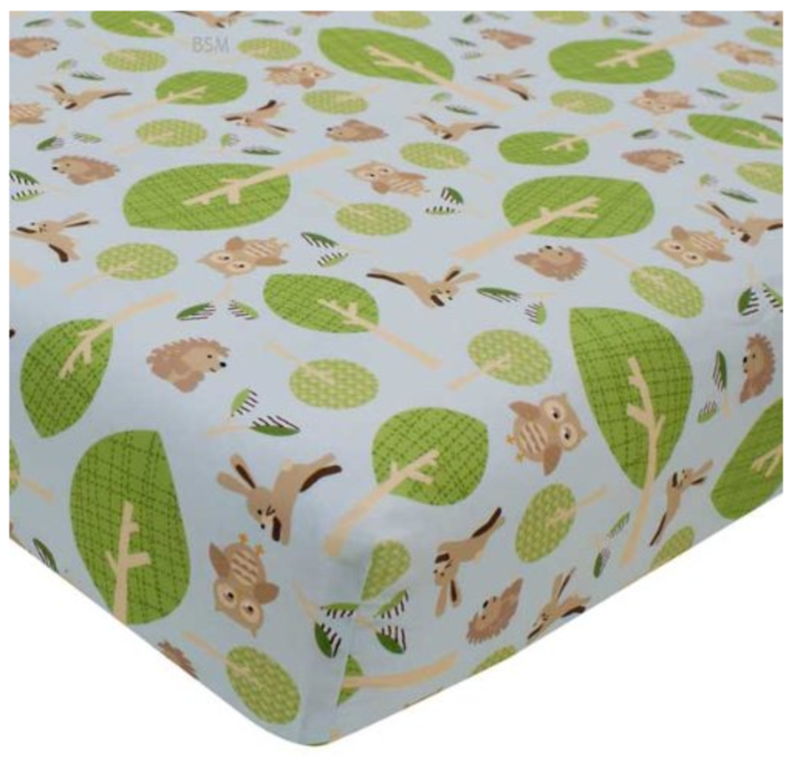 I love this cute and sweet forest animal and tree baby bedding set. It has the soft, earthy colors but is simple, clean and modern as well. 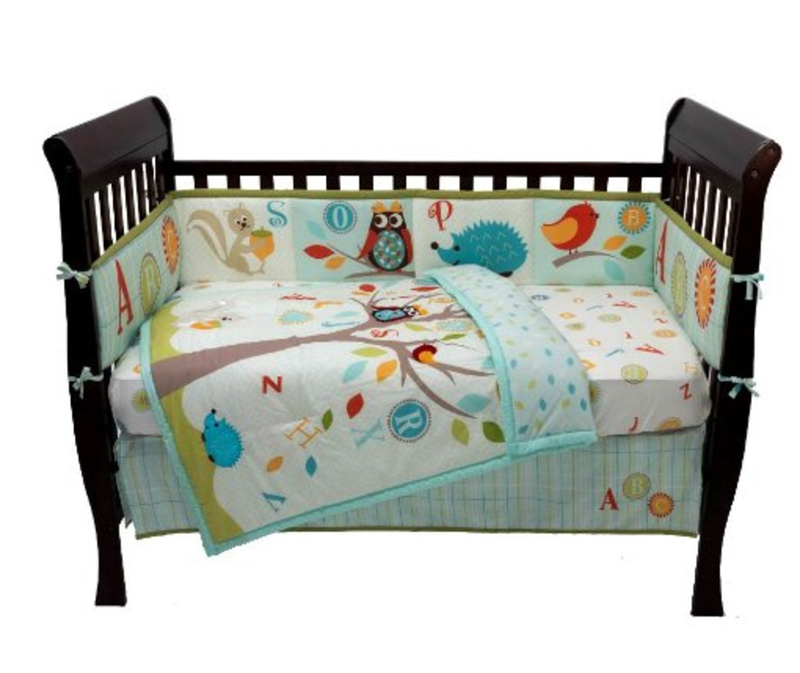 The cool thing about this set is that you can choose from different options for crib set combinations (with or without bumper, different patterns in bumpers and crib sheets, etc.) or you can buy all the items separately. The comforter is so cute! I love the different patterned fabric, quilted look. 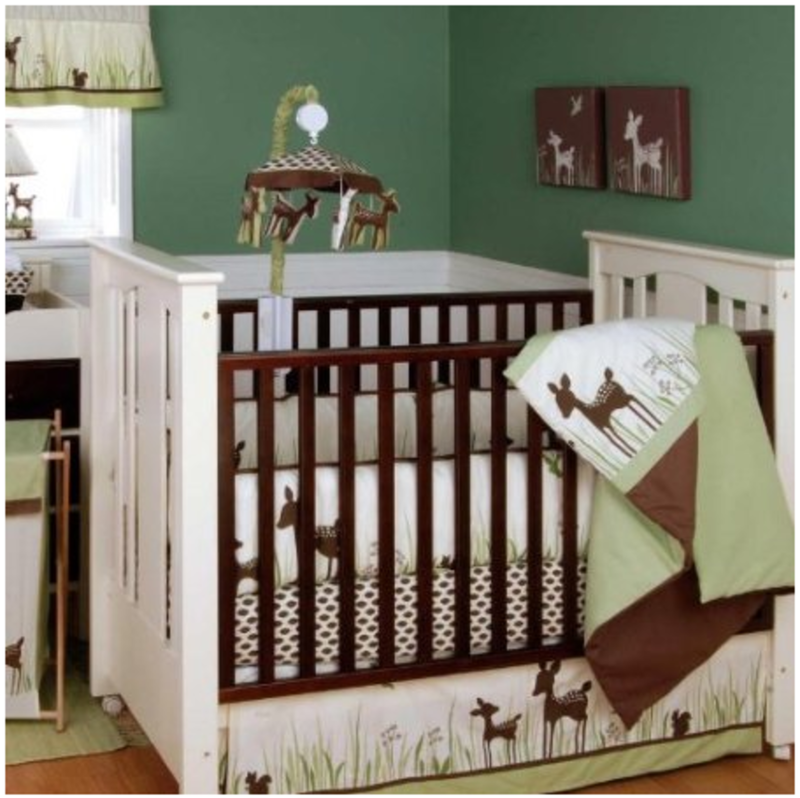 The comforter, crib set and other décor items are also available. 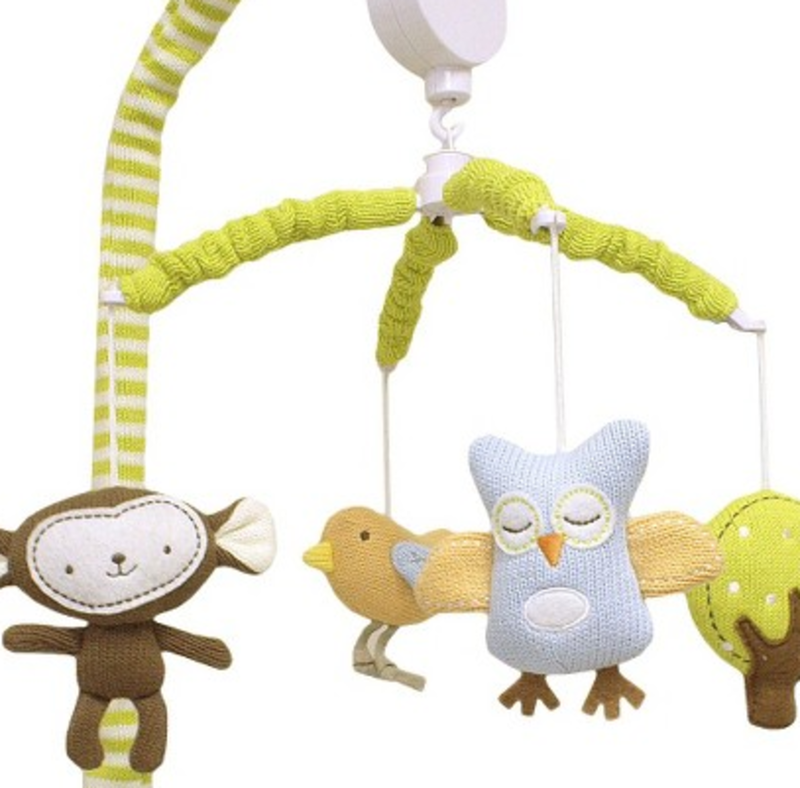 I love the knit look of the adorable Lolli Living monkey mobile. It has a lovely handmade look. 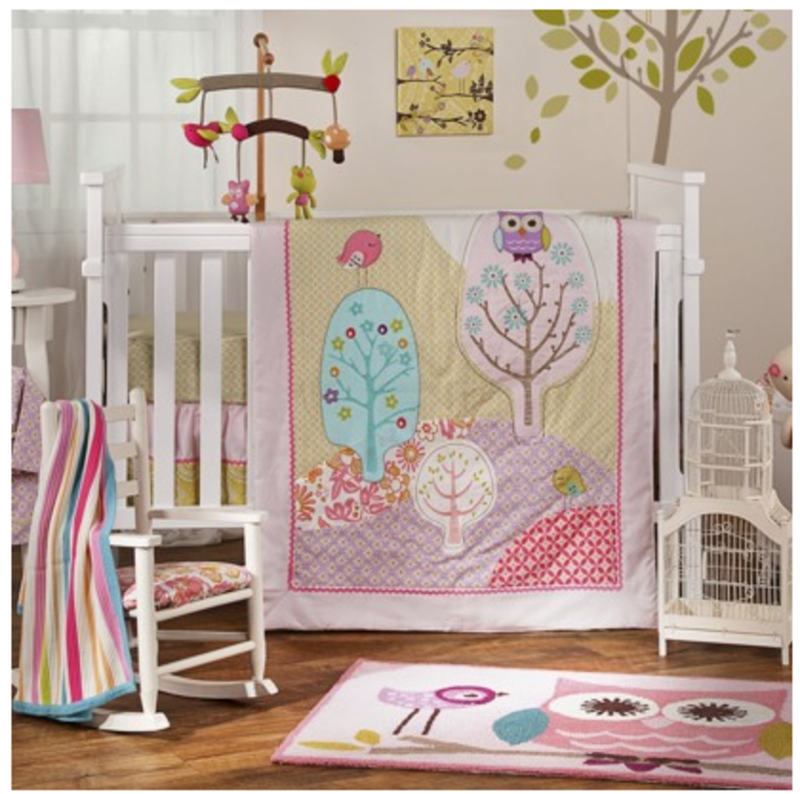 Here is another adorable forest and animal bedding set for a little girl's room. 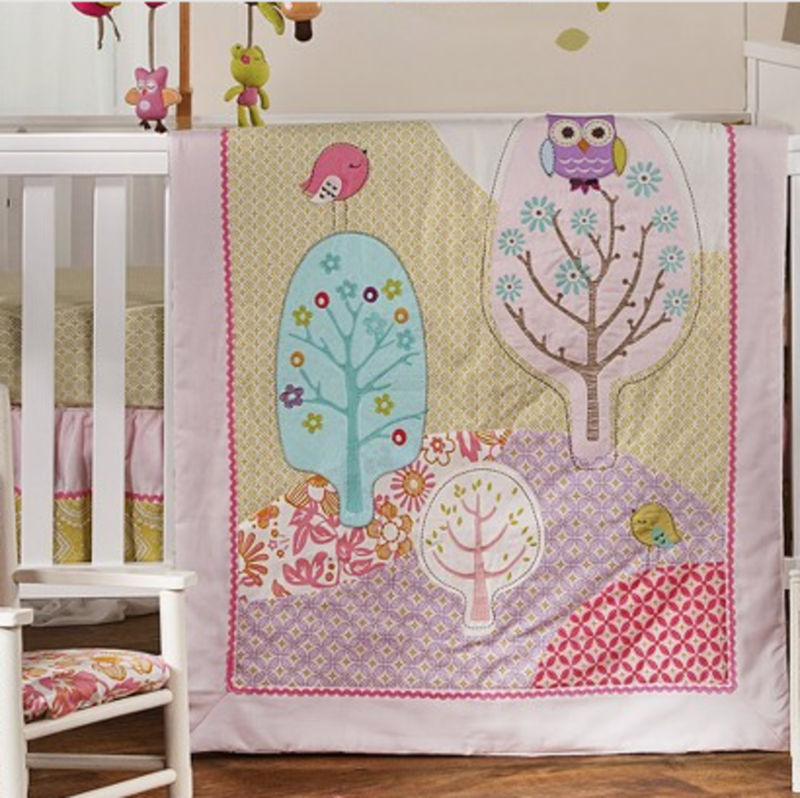 With pastel pink, lavender and trees, birds and owls, this is a cute nature theme for an earthy and girlie baby room. 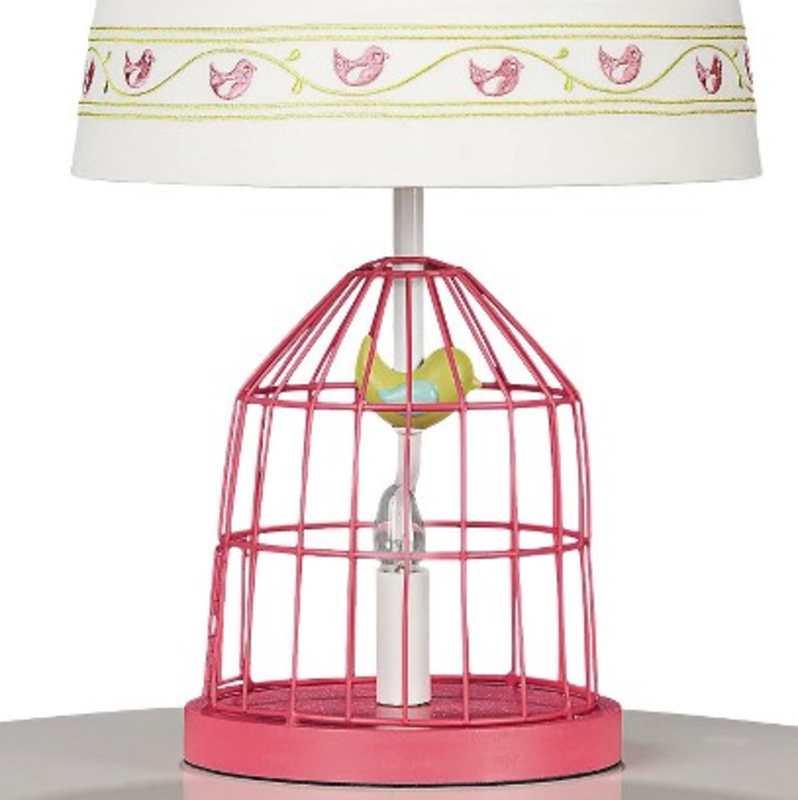 I love their little bird cage lamp. It is so sweet! This set has some unique animals featured like the kangaroo, koala, and the chipmunk, but I decided to feature this as "woodland" theme because of the earthy browns, the chipmunk and the fox. 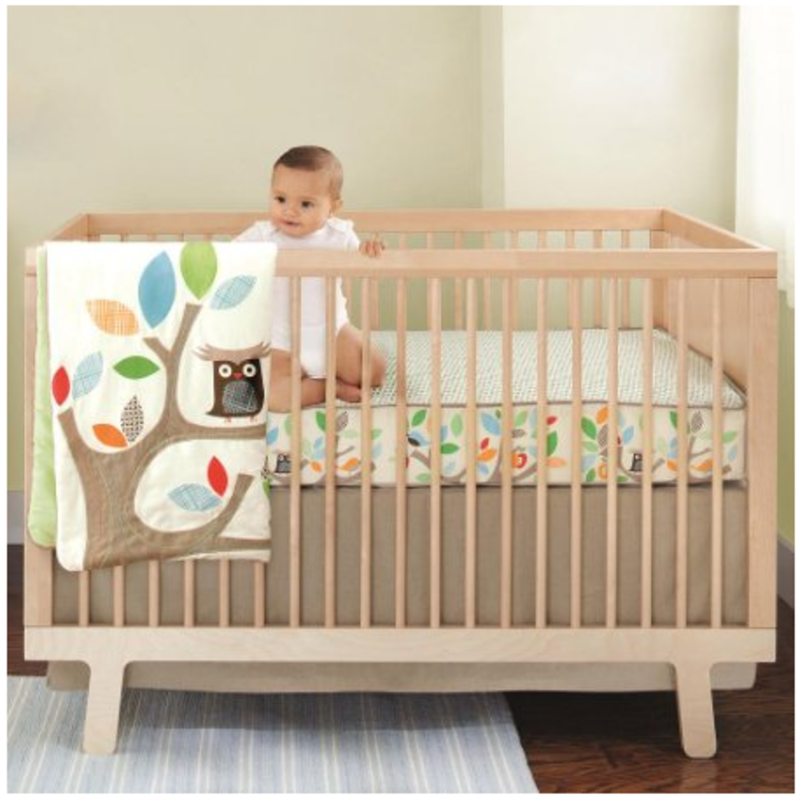 The Aussie flavor is an added bonus for the natural baby room designs that show up on the crib set, sheets, leaf covered mobile and other matching textiles. I love this new set! It is so cute and it you can buy a bunch of fun accessories to match, too! 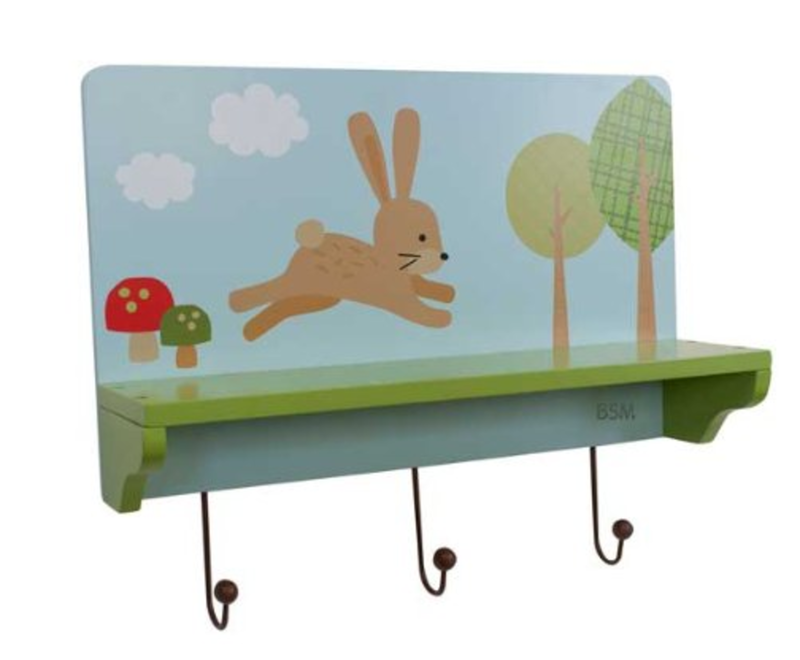 Little Hoot has a cute little wall shelf with a bunny, clouds, and mushrooms. The fitted sheet is so cute, too! I love the colors and the little bunnies and owls. 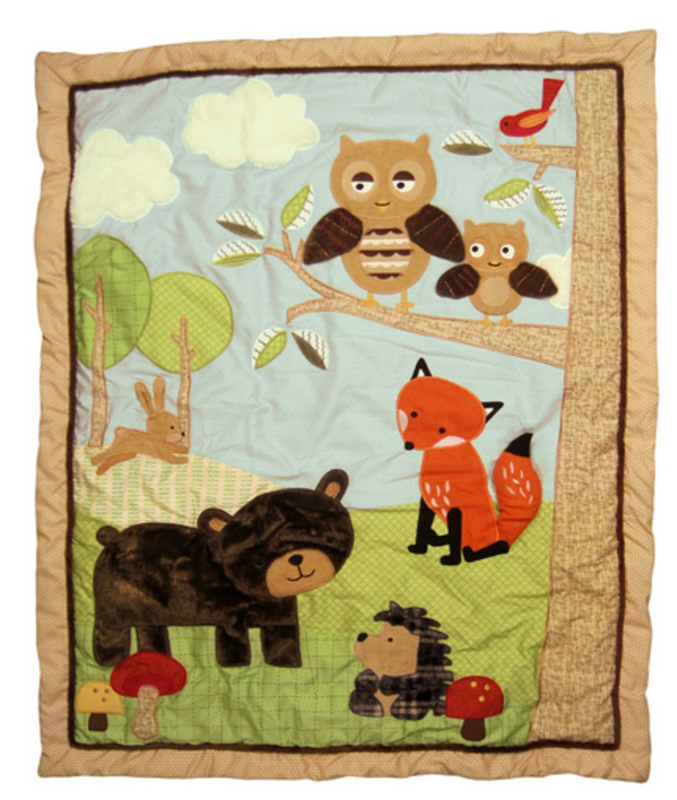 Carters Forest Friends is another classic adorable woodland creature themed nursery bedding and accessories line. 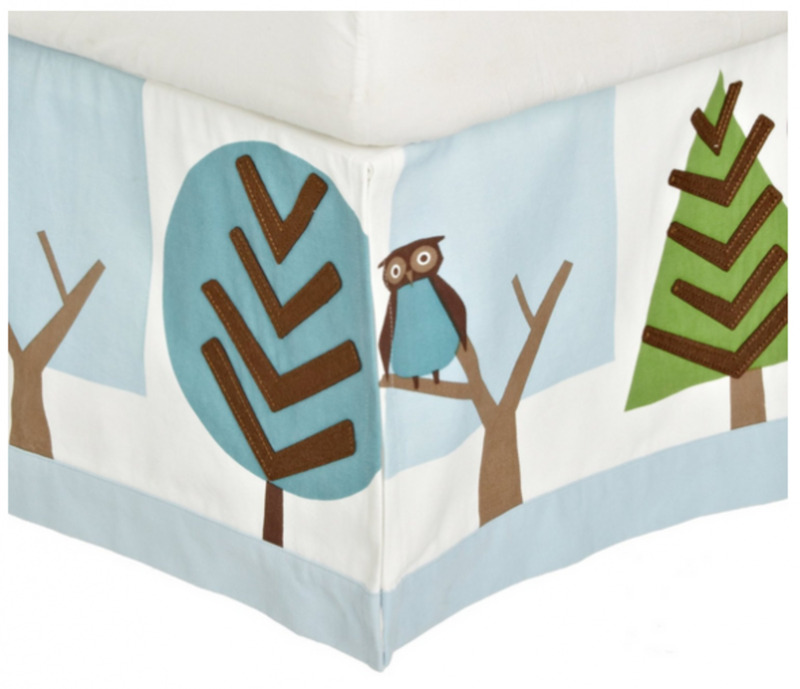 Head on over to my blog to see all the Carter's Forest Friends Crib Set, Décor, and Accessories! I realized, when I purchased the Forest Friends wall decals, that there wasn't any instructions or picture to follow to assemble the tree and place the animals. I placed each piece very lightly, just enough for them to stick, without pressing into place. This way, I could reposition the decal if I stepped back and didn't like the placement. I did my best to get a good balance with my branches and leaves, by starting with the tree branches, following with the animals/birds I wanted to place in my tree. Then I added all the larger leaves, working with 1 color at a time to maintain my symmetry as best as possible, and worked my way down to the tiniest leaves until I was done. I decided to place the animals to look like they were standing on the rail of the crib, which turned out very cute and filled out the space very nicely. I even put the fox on the side wall, for a little element of surprise. Once I was happy with the placement of my decals, I pressed each piece into place. I'm very happy with the results! 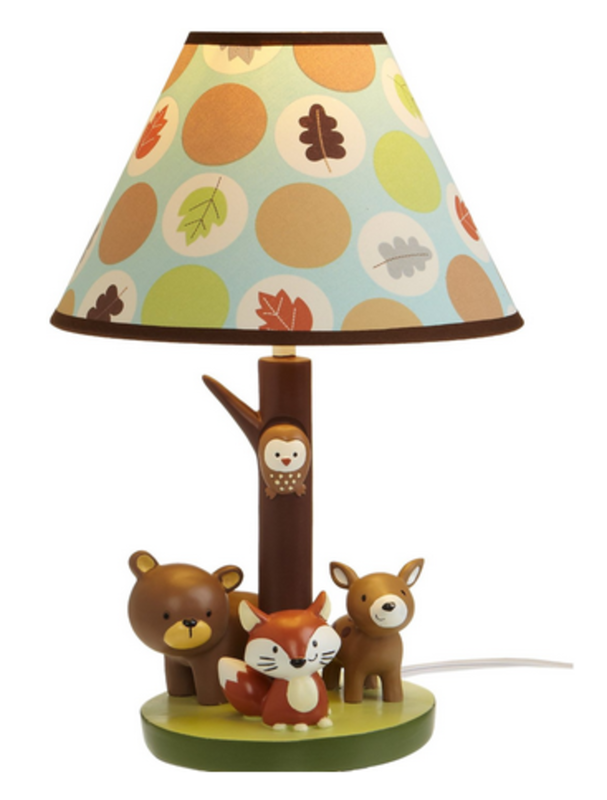 Here is the adorable lamp that goes with Carter's Forest Friends. I matched this one up with my Woolrich Woodlands décor as well! 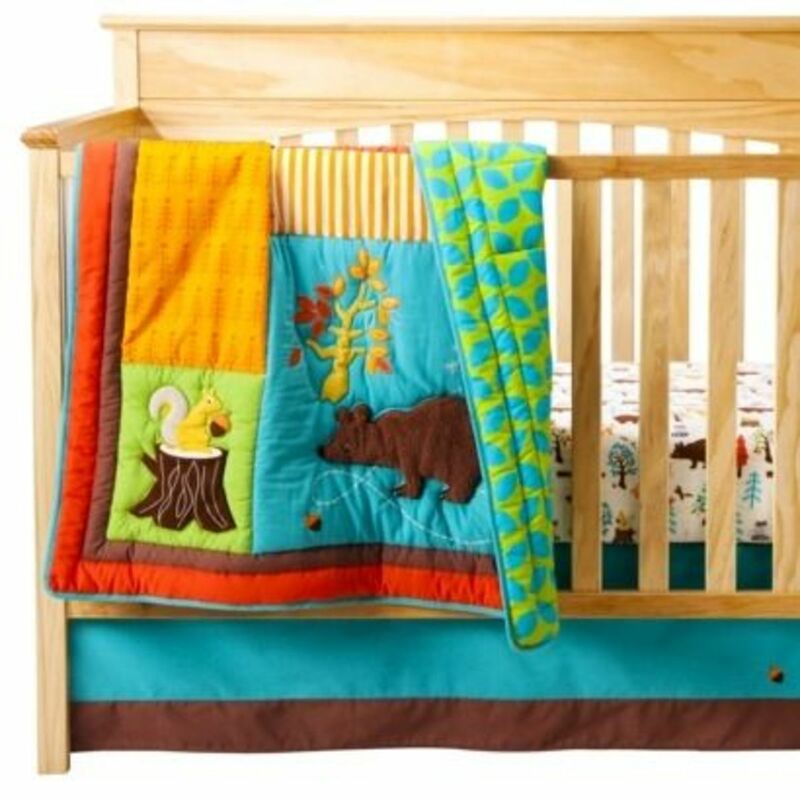 When it was time to decorate my son's nursery, I went with Woolrich Woodlands bedding. It is sold exclusively at Target and it looks so cute with sky blue walls and a grass green rug. 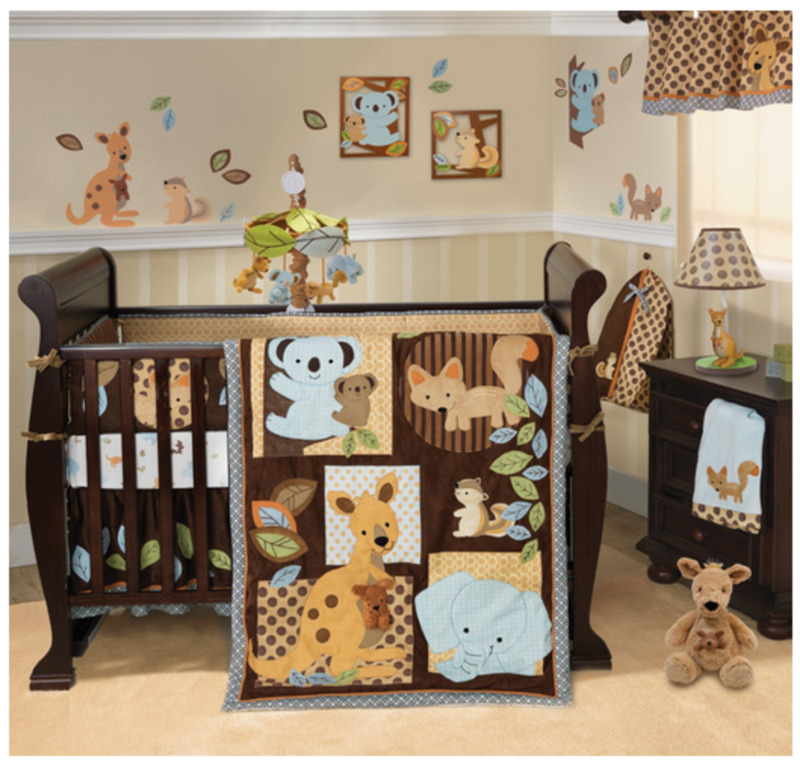 This is my favorite line because it can easily match some of the other woodland style décor lines and it mixes the true "baby" colors with the earthy and natural tones. The very gender neutral look incorporates a light pink and turquoise blue. Some other very special touches are the adorable little rug, the nightlight and switchplate cover, and the 3 piece plush animal wall art. 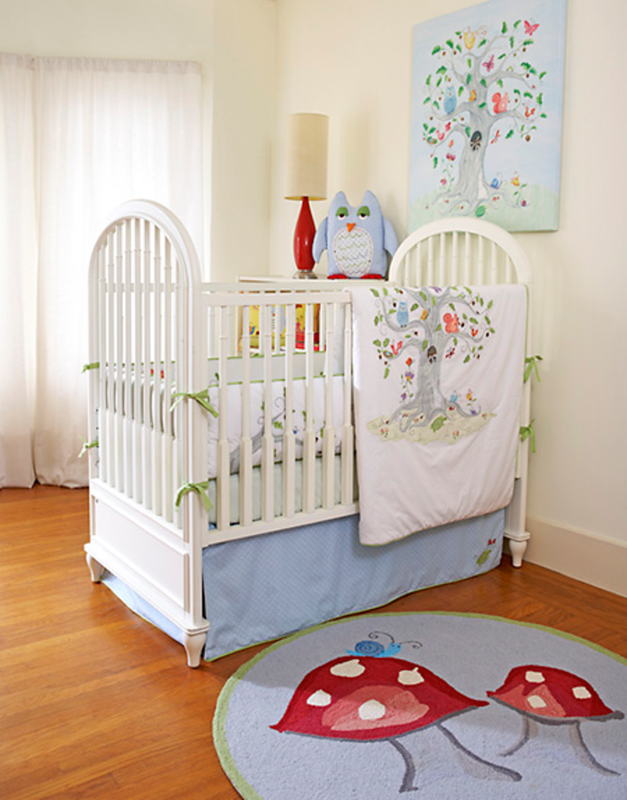 The Wishing Tree 3 Piece Crib Bedding Set by The Little Acorn is so pretty! I love the beautiful tree and cuddly little forest creatures that look as if they were hand painted. 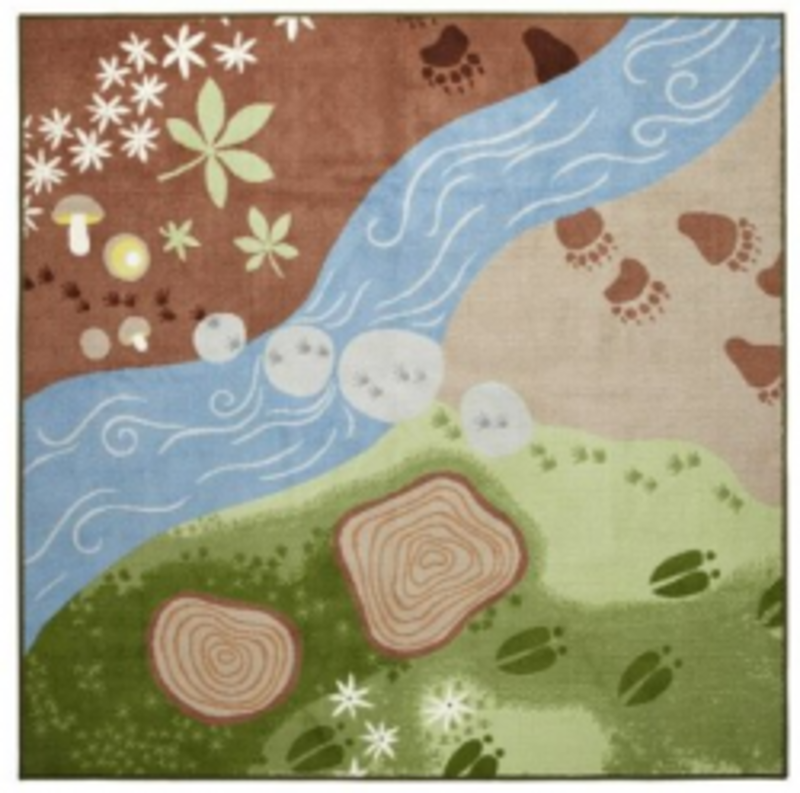 Lambs & Ivy Enchanted Forest - So many pieces in this collection can mix and match with other designs, too! 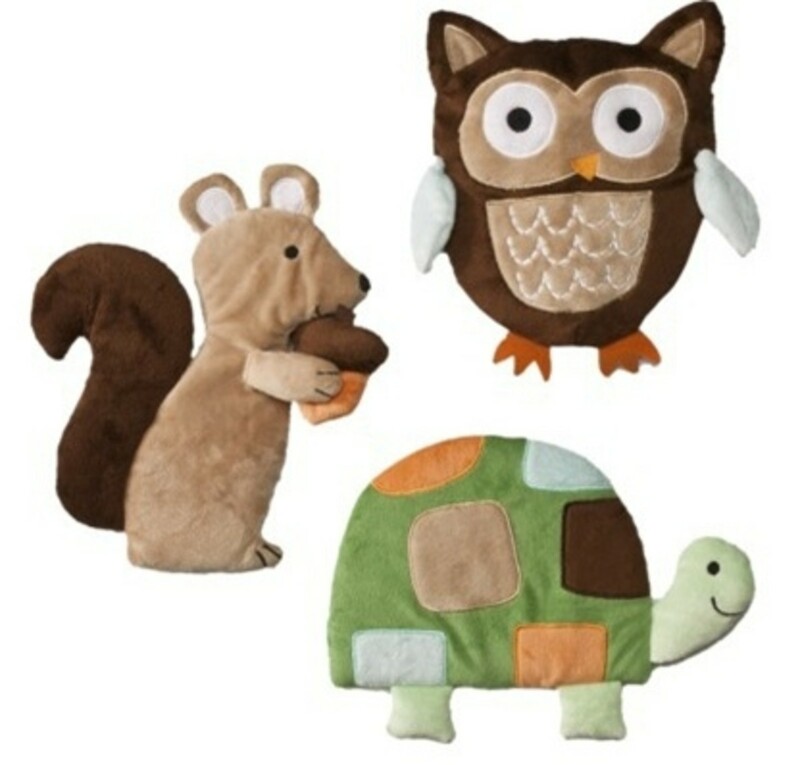 The bedding set for Lambs & Ivy Enchanted Forest has the cutest collection of forest animals, including a deer, a beaver, and an owl. I'm not sure if my favorite thing about this set is that you can purchase a mini chair with a deer applique or that the mobile has a raccoon that climbs up the stem. 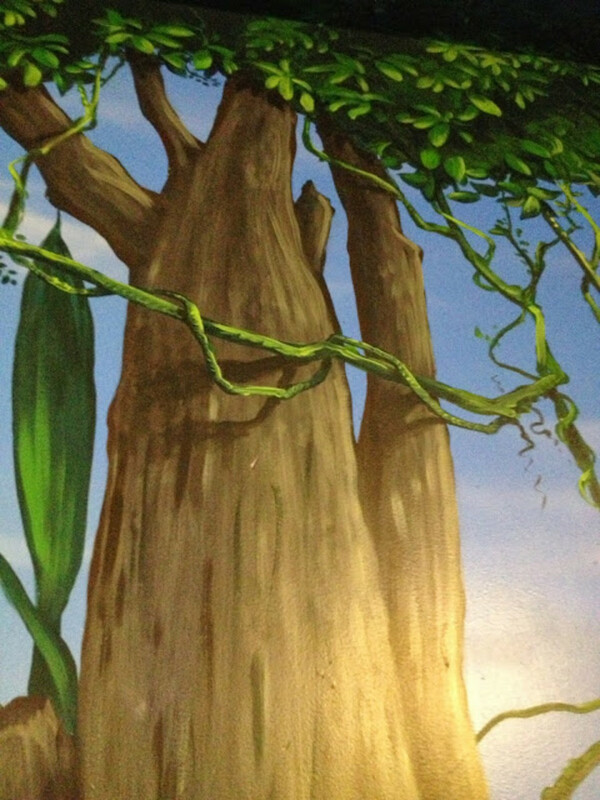 I would definitely say that the Enchanted Forest is gender neutral, without being too girly-girl. What it lacks in the pinks for a girl, it makes up for in cuddly baby deer and sweet little birds. This line is extensive, complete with a matching lamp, decorative pillows, hamper and wall appliques. These are also great pieces to mix and match with other brands and themes! 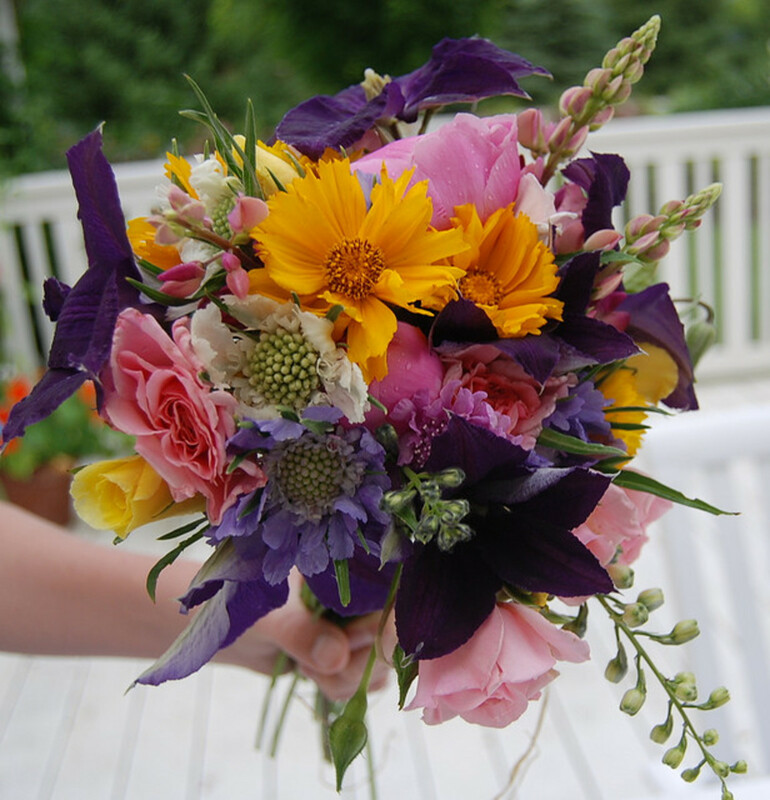 I am really into the bright colors, even for the earthy nature themes, right now. I love the little forest creatures amid bold yellows and turquoise with reds and oranges in the Kids Line Little Treehouse collection. 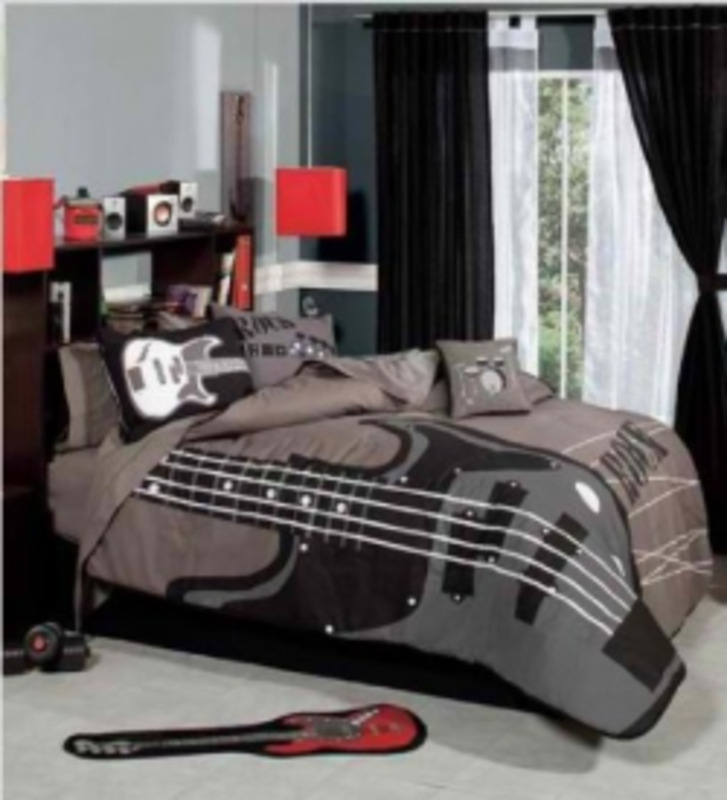 It is an added bonus that they not only have a bedding set, but lamp, window valances and wall decals, too! 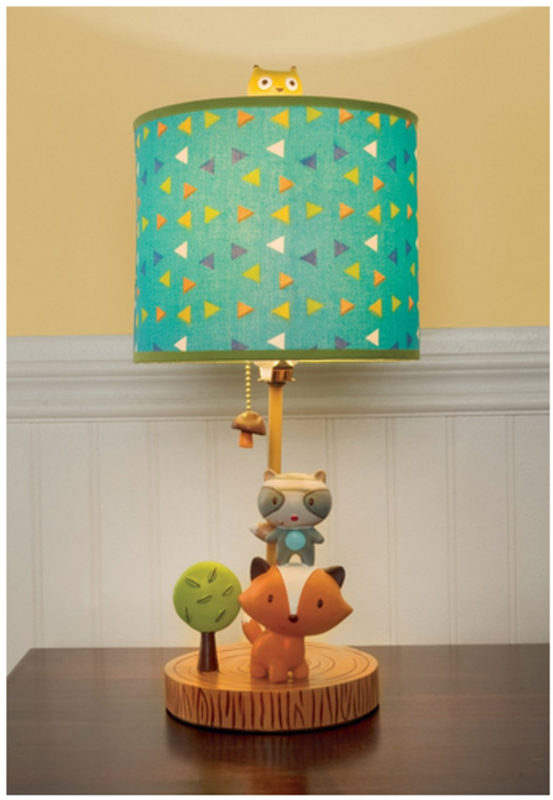 Kidsline Little Treehouse Lamp - Here's the cute lamp that goes with this set! This is one of my favorite lamps for a baby room. Maybe it's because I love the color turquoise, right now, and maybe it is because it is so darn cute! Either way, it is really nice to be able to go with a crib set and have all the accessories to match like the one above, has. 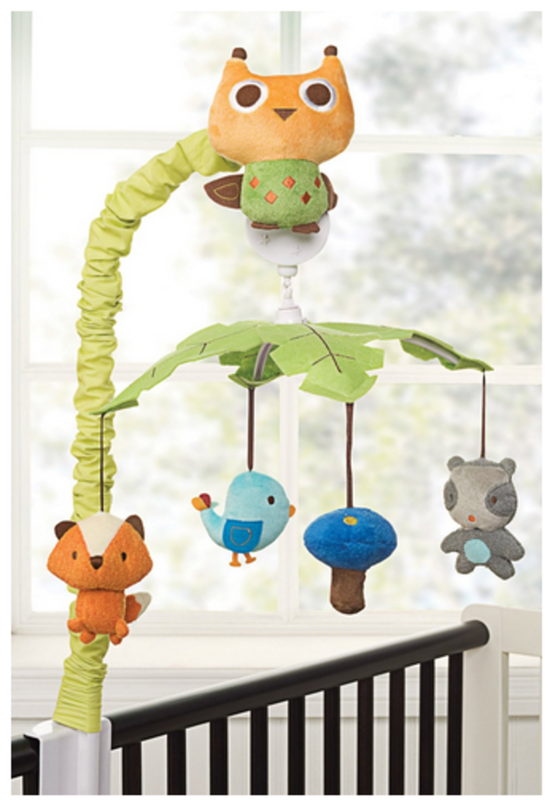 Kids Line Little Treehouse Mobile - This is an exceptionally cute accessory! This adorable mobile also goes with the set above! This will be something a little one will love to look at. I think this floor covering really mimics the color and texture of grass in a modern way. 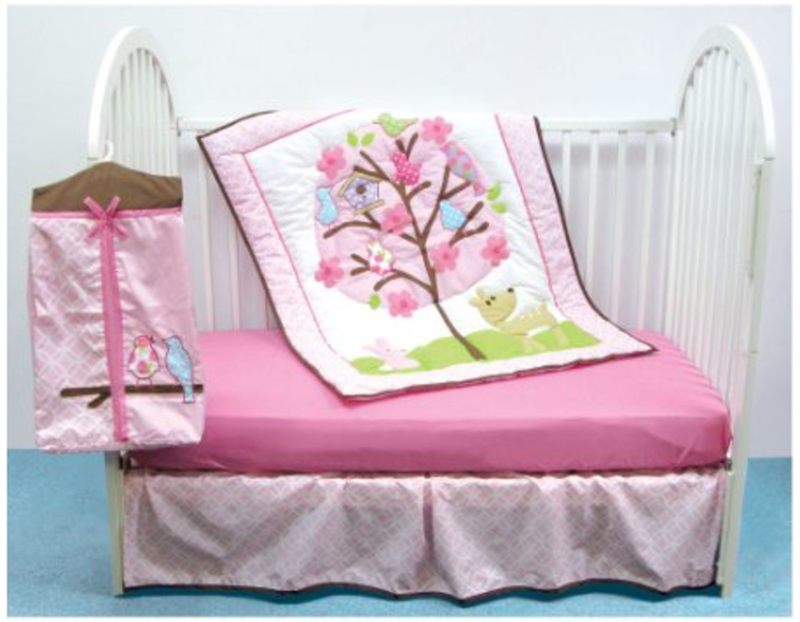 Luvable Friends Tree 4-Piece Crib Bedding Set - in pink or blue... perfect for twins!!! 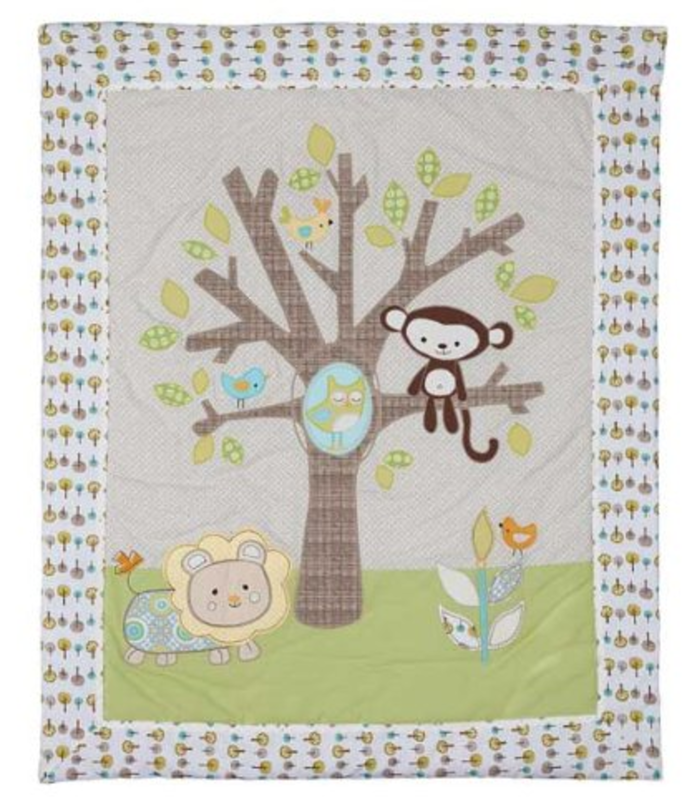 The Luvable Friends Tree baby bedding set is a cute and inexpensive forest and tree theme bedding set for a baby girl room. 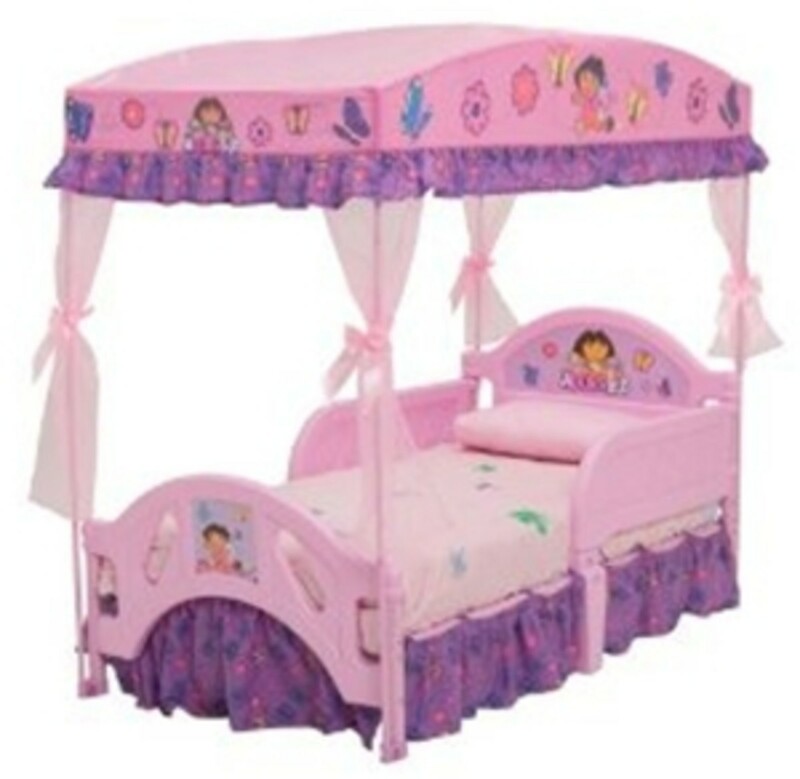 They also have the set in blue which makes this the perfect set for boy and girl twins! I love how this set is similar to the pink Luvable Friends set, but the animals are slightly different and not just a straight copy in blue! This bed set is so perfect for boy and girl twins! 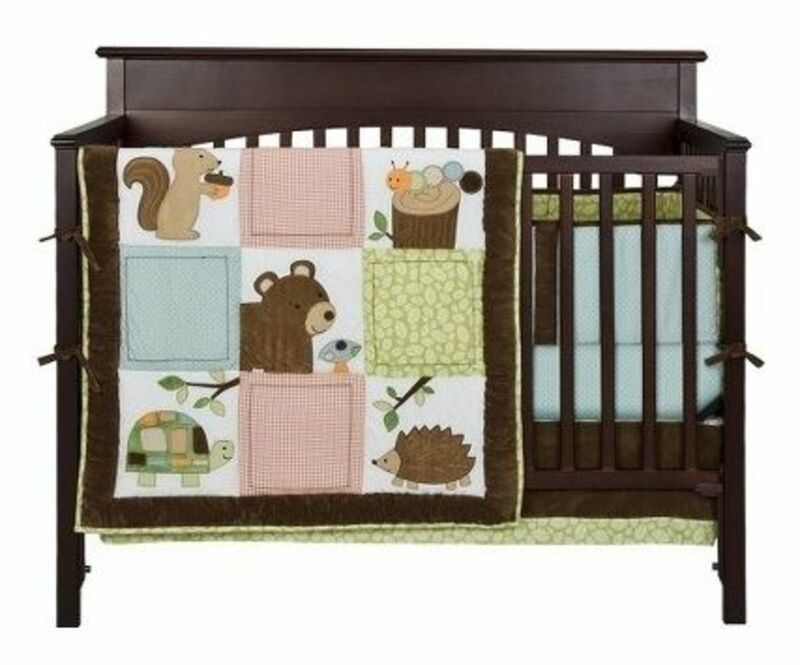 The Eddie Bauer is a super sweet blue and brown baby boy crib set with a cuddly woodland creature theme. 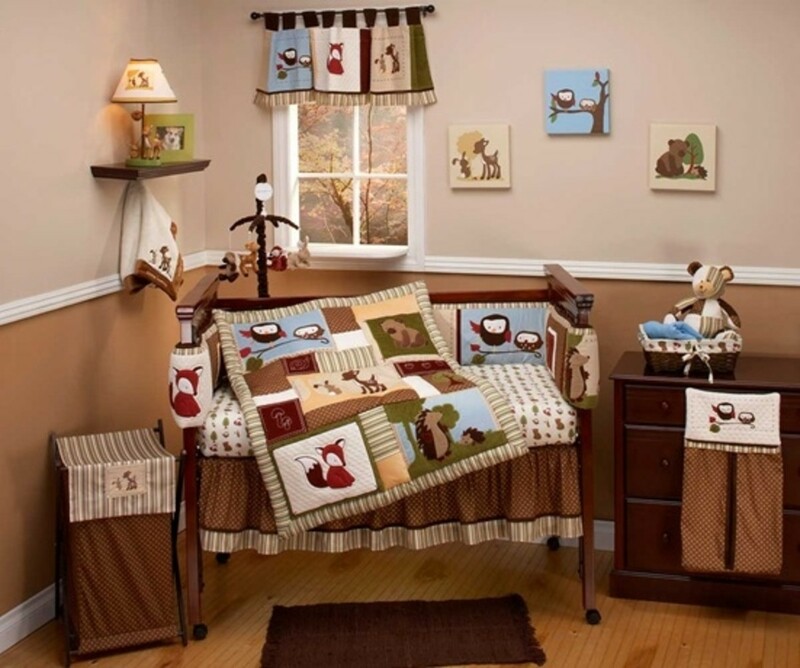 You can also buy the window valance, lamp, wall decals, wall art, fleece blanket and mobile to match this adorable baby boy nursery set. I love how they did the wall decals in this room. It would look really fantastic with wainscoting or a two-tone painted room! Do you want your baby room to look like a cozy cabin in the woods? 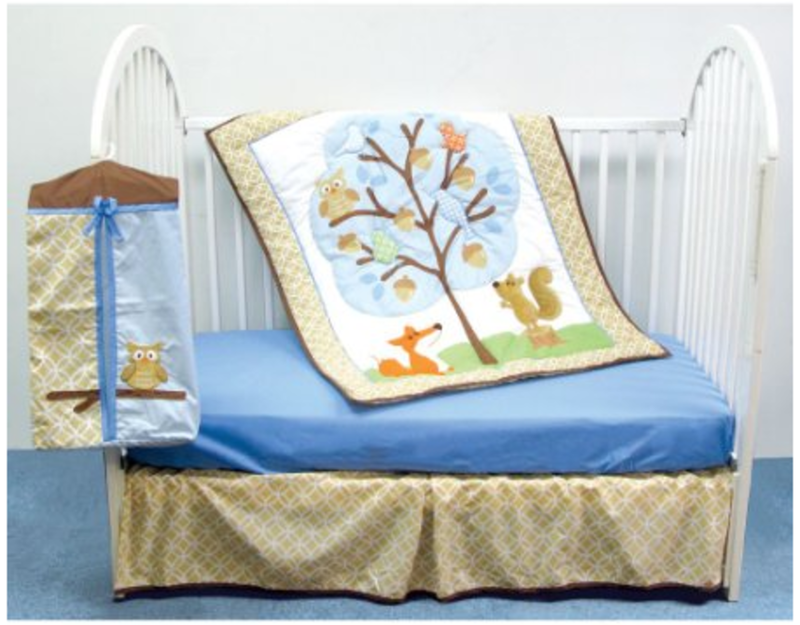 Then Eddie Bauer has the Enchanted Hollow bedding and accessories for your nursery! 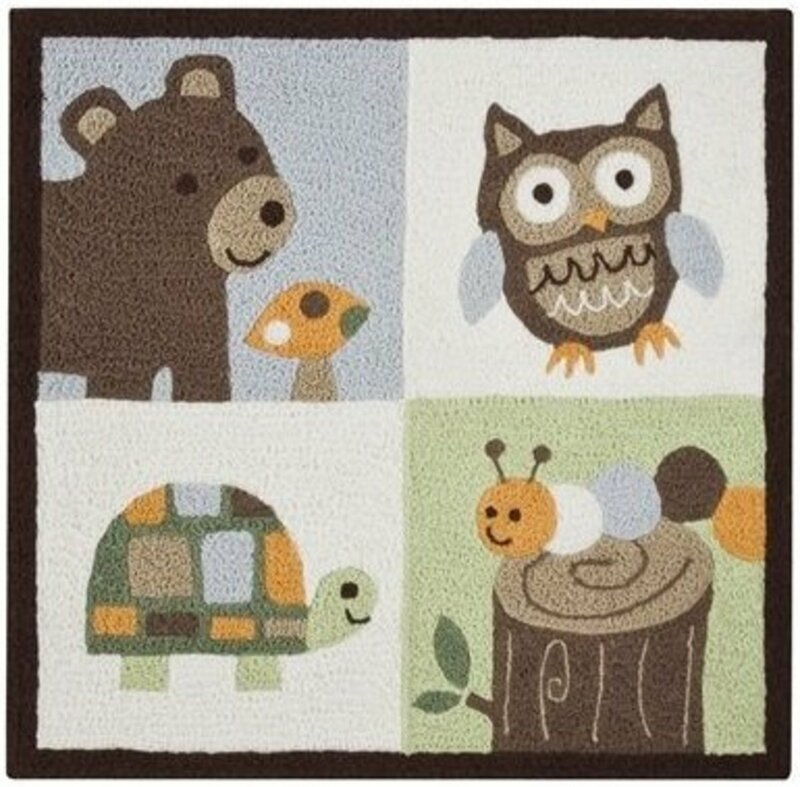 Featuring foxes, bears, owls and the usual woodsy crew, this set is makes me think of mountain, country, forest and lakes and would be perfect for the little outdoorsy one! 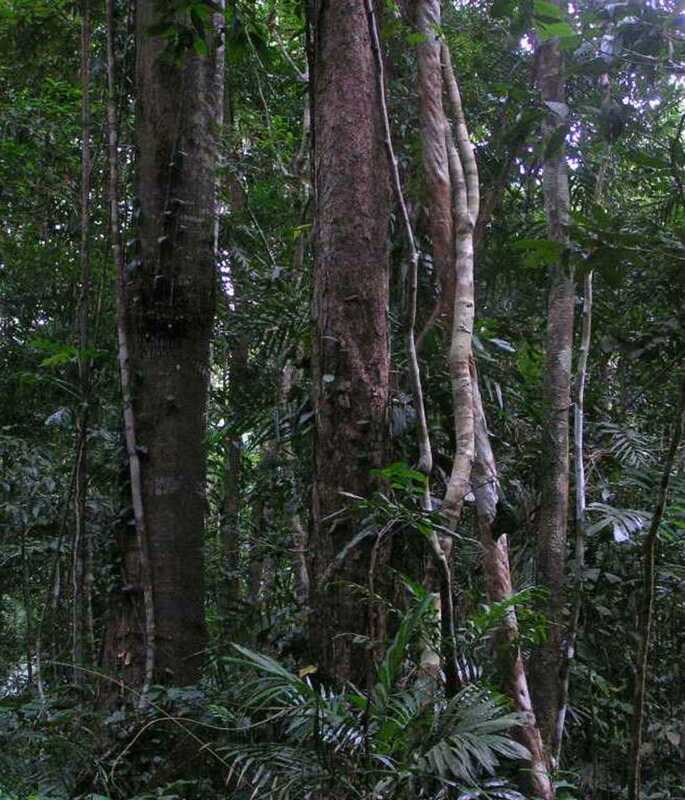 These prints match PERFECTLY with the Skip Hop Treetop line and you can buy them in a set of 3 8x10". There are actually 7 different prints with different animals and one print that has ALL of the animals and birds in it. Every Treetop friends print comes in standard photo frame sizes from 8"x10", 11'x14", and 16"x20" so you can buy frames off the shelf to decorate your nursery. Also, you can buy the prints individually or in sets of 3, making it SO easy to fill all your wall space. The Willow Organic set includes the duvet cover and insert, the fitted sheet, the bumper, the diaper stacker, and dust ruffle. This set is made out of 100% organic cotton and is colored with non-toxic vegetable based dyes. JoJo Designs Forest Friends line has a lot more of the rust colored tone, mixed with the avocado green, a touch of light yellow and the staple in these woodland creature themes; the rich chocolate brown and earthy nuetrals. I would probably consider this line a little more on the baby boy, side, but again, cute little woodland creatures is something a little girl would cuddle up to, as well. Some of the unique offerings of this line are the wallpaper border, the full length curtains and the matching plush wallhangings. By far, the coolest feature is that toddler bedding and twin size bedding are available as well, to carry this décor right on through to the tween years. I didn't really like how the wall plush looked on their own. They looked lonely and isolated, so I decided to create simple art canvases on which I could place the wall plush with an adhesive. I think they turned out really cute and they look fantastic in my son's room. 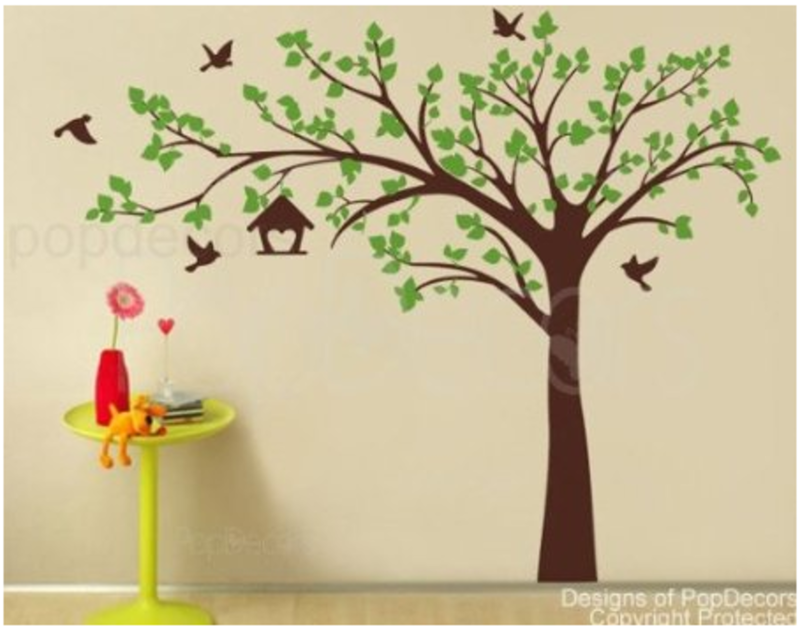 Grow a big tree in your baby room - Or just place a tree decal! 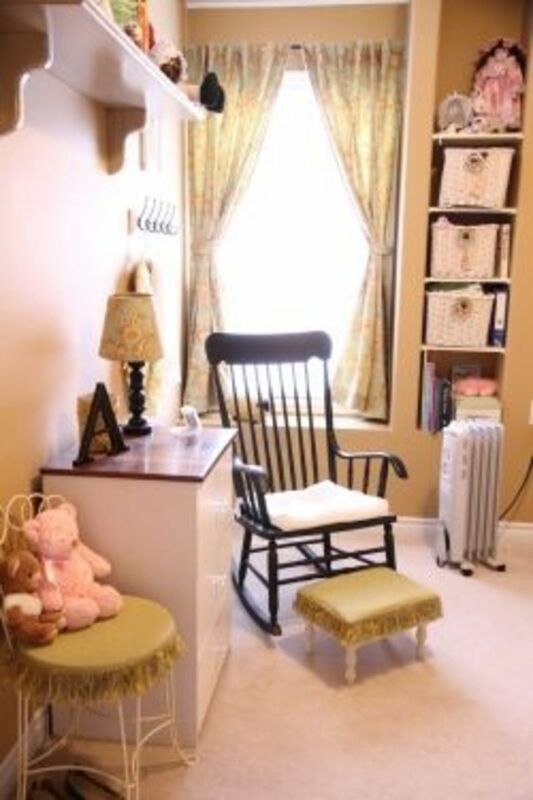 This is a great way to make the baby room truly magical! Not only can you find all of the above bedding and décor items on eBay, but you can find a TON of custom wall art and décor items to match these themes as well! 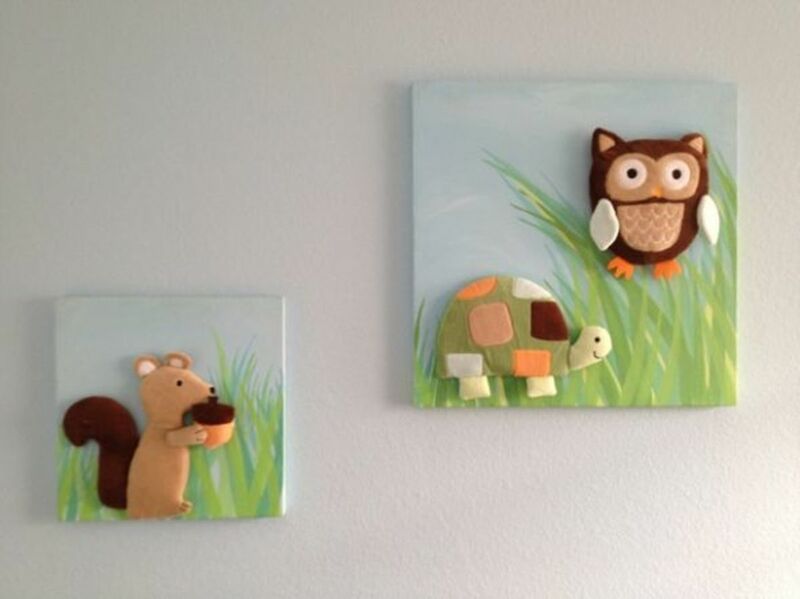 Artists and crafters create all kinds of beautiful pieces to add to your forest animal baby room and the prices are super reasonable, too! I really like this lens. Some fantastic ideas here! That is so cute. Those decorations can make any nursery look great. When my boys were younger, they had nature décor too. Now they are nature lovers. Wow, so many beautiful decorations... ;-) Thanks a lot for sharing this wonderful lens!!! I don't have kids yet but this would be super cute as a baby boys bedroom theme. love it! 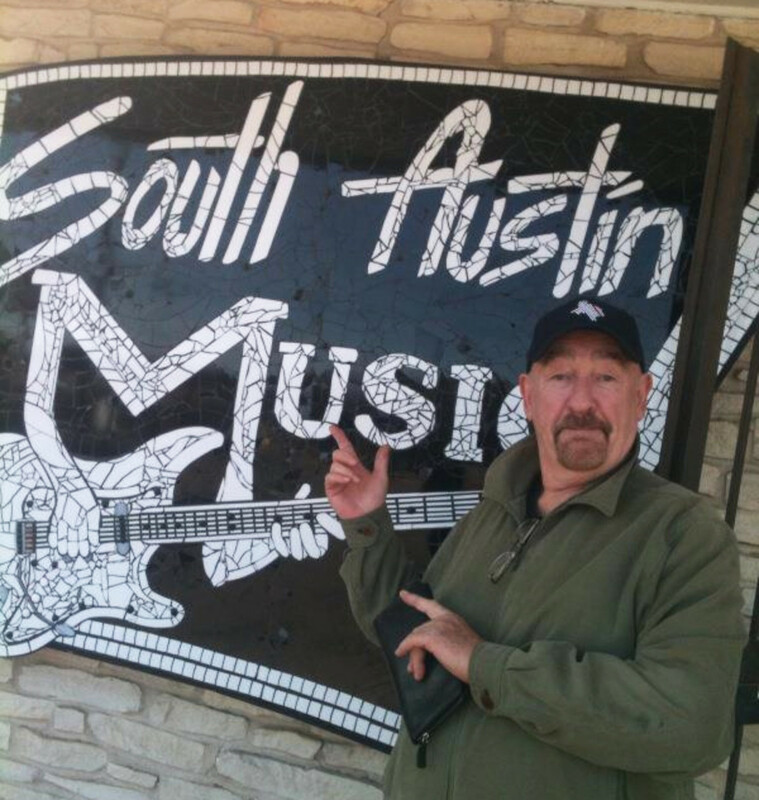 @LizMac60: Thank you! Thank you for the blessing, too! Enjoyed my visit to your lovely lens.Blessed. This is an adorable lens. 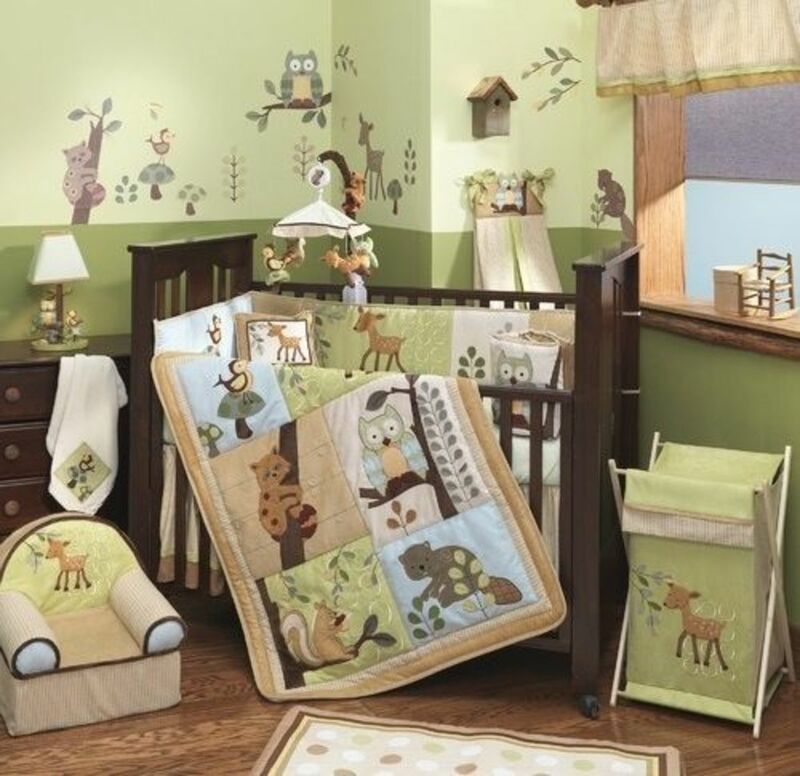 I LOVE the woodland theme, and it works great for a babies room as well. This lens is so well thought out and organized, really inspiring stuff. Your baby is also super cute!